Here is a good newspaper article in today’s Online Telegraph by Jeremy Paxman looking at “The Path that led from the Playing Fields to Flanders Fields”. It especially examines the role of the public schools in England the role they had in providing officers for the military, and the effect on the schools and their staff – think lots of women coming into teaching for the first time. Registration for the 2014 British Institute is now open. The British Institute is 20-24 October, 2014 at the Salt Lake Plaza Hotel, Salt Lake City, Utah, and arranged by the International Society for British Genealogy and Family History. The classes are small enough to allow for good student / teacher interaction in 20 hours of classes, plus one on one guidance sessions with the instructor next door in the world renowned Family History Library. This years instructors are: Tom Jones – From Simple to Complex: Applying Genealogy’s Standard of Acceptability to British Research; David Rencher – Researching your Irish Ancestors; Paul Milner – Scottish Research: The Fundamentals and Beyond; Darris Williams – Welsh Family History Made Simple. Note – Early Registration ends 15 August and the price goes up. These courses do fill up so make your reservations early. Come join us as this will be a great learning experience and you can immediately put what you learn into practice in the best genealogy library in the world. 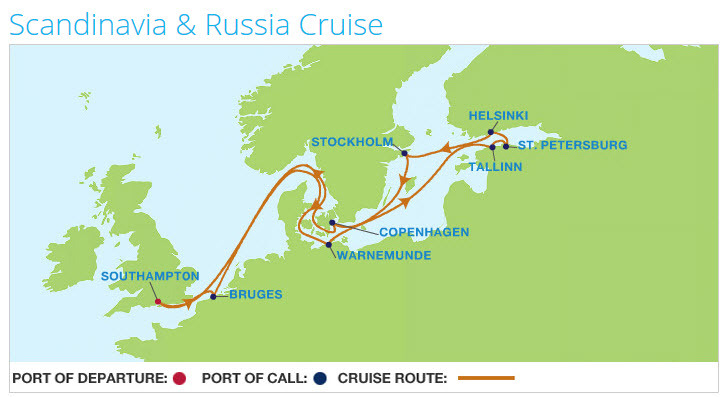 Unlock The Past has confirmed the key speakers on its 8th Genealogy Cruise for 14 nights from Saturday 11 July 2015 to Saturday 25 July sailing from Southampton England to the Baltic Seaports aboard the Celebrity Eclipse, operated by Celebrity Cruises. The key speakers are Paul Milner (myself, just in case you came here via a search engine and you missed who’s blog you are reading); Cyndi Ingle of Cyndi’s List fame (http://cyndislist.com) from the United States; Carol Baxter, the History Detective, a great history writer from Australia (www.carolbaxter.com) ; and Chris Paton from Scotland who writes British GENES, a must-read blog for keeping up-to-date on the news from the genealogy world in the British Isles (http://britishgenes.blogspot.com). Other speakers who have provisionally signed up include Rosemary and Eric Kopittke, and Helen Smith from Australia; and Carol Becker from the United States. All but Cyndi Ingle have been on past Unlock The Past genealogy cruises, so are well known by this cruising audience. This cruise will offer over 100 topics offered in 50 sessions; special interest groups; Research Help Zone times offering one-on-one and small group opportunities with the experts; opportunities to purchase Unlock The Past and author publications; with visits to some of the world’s great cities along the way. From Southampton the cruies will sail to: Zeebrugge (Brussels) Belgium; Warnemunde, Germany; Muuga (Tallinn) Estonia; St. Petersburg, Russia; Helsinki, Finland; Stockholm, Sweden; Copenhagen, Denmark; and returning to Southampton. Let’s take a closer look at the Scottish Soldiers wills so proudly announced as being available on ScotlandsPeople in the last post I made so we understand how and why the records were created, collected and how to search them – without wasting lots of money. What’s there? – There are 32,932 wills in this collection. Approximately 26,000 wills from ordinary Scottish soldiers who died in WWI, another 5,000 from WWII, several hundred from the Boer War and the Korean War, with others from conflicts between 1857 and 1964. How did they get there? – When a soldiers estate was settled by the Effects Branch of the War Office their wills were no longer required. All documents were then passed along to H.M. Commissary Office in Edinburgh under the Regimental Debts Acts of 1863 and 1893. Later they were deposited with the National Records of Scotland, now in SC70/8. The majority of the wills, especially those from WWI were the page(s) removed from the soldiers Pay Book (Army Book 64), or an equivalent Army form. Other documents might include personal letters from soldiers, a testimony by witnesses, both of which could be accepted in lieu of a will. The majority of the wills were written by men below the rank of officers, who were domiciled in Scotland. The example is for Peter Trainer of the Queen’s Own Highlanders who died 25 Apr 1918 leaving everything to his father Robert Trainer of 88 Gloucester Str, Glasgow. 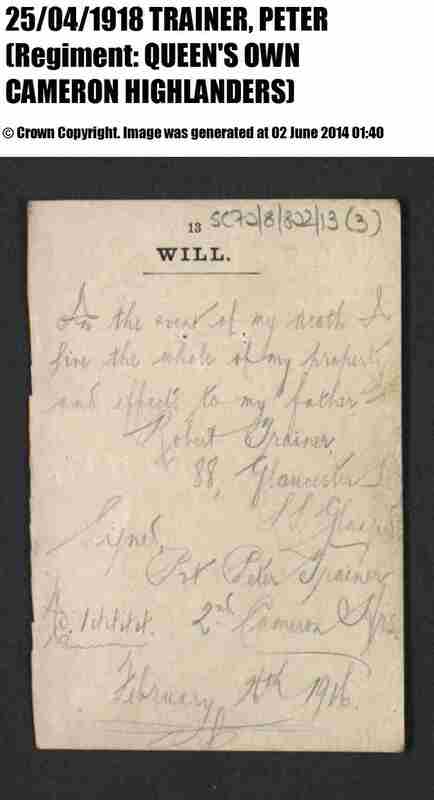 The will is one of four images in the file, which is common, the other images being of the army’s sheet for the will, plus two envelopes (inner and outer). It is estimated that this collection of wills represents approximately 20% of Scotsmen who died during WWI and about 17% of those who died during WWII. The records begin in 1857, but there is only one will for 1857 and that is for Private Roderick Alexander of the 71st Regiment of Foot [71st (Highland) Regiment of Foot (Light Infantry)] and his will is signed 19 Jun 1857 and importantly it is not the date he actually died, that is not stated on the document [SC70/8/7/1]. You have the options of searching on surname, forename, date of death – from and to, service number, rank, battalion, regiment, theatre, and cause of death. The reality is most of us are going to use surname, in possible combination with forename if we get to many results. Date of Death – this is a key searching point. If you know you are searching for someone killed in WWI then change the dates appropriately. Generally I would recommend leaving the defaults at 1 January 1914 and 31 December 1948 and it will search everything in the database and include them in the results, even when the event occurs outside these parameters or the date of death is not stated. Change either date and it does limit the search to the period chosen. Let’s do a search for Hunter without adding or changing anything. I get 134 hits. Viewing the search results is free, so I could look at all 183. Instead I want to limit my options and I type ‘Jo’ (without ‘’) in the forename field and select ‘forenames that begin with’ from the adjoining menu. Now I have 18 options and that is a more manageable number, so I look at the results. Quickly scanning the list shows that I have found multiple Johns, a John Alexander, two Josephs and a Jonathan. National Archives Scotland Search screen for the will of Jonathan Hunter in SC70/8 – Scottish Soldiers Wills. In our results table you will see Jonathan Hunter, rank unstated, of the 91st Regiment of Foot, who died, with no date or place given. We know that regimental numbers were no longer being used by WWI, so we can safely guess that this is a pre-WWI soldier. That however is still a potentially big time period 1857-1914. So how can we narrow down our options to see if it is worth spending the money on getting the will? Go to the free website of the National Archives of Scotland at www.nas.gov.uk and select Catalogues and Indexes from the top menu, then NAS Catalogue, then Search. You have three search fields – in the search for field type the name of the person you are seeking (surname or both forename and surname if too many results) – in the reference field type SC70/8 plus select the ‘starts’ button and this will search the collection of Scottish military wills – leave the date from field blank. In my case I am going to search for Jonathan Hunter in SC70/8. I get one matching record which I can display. 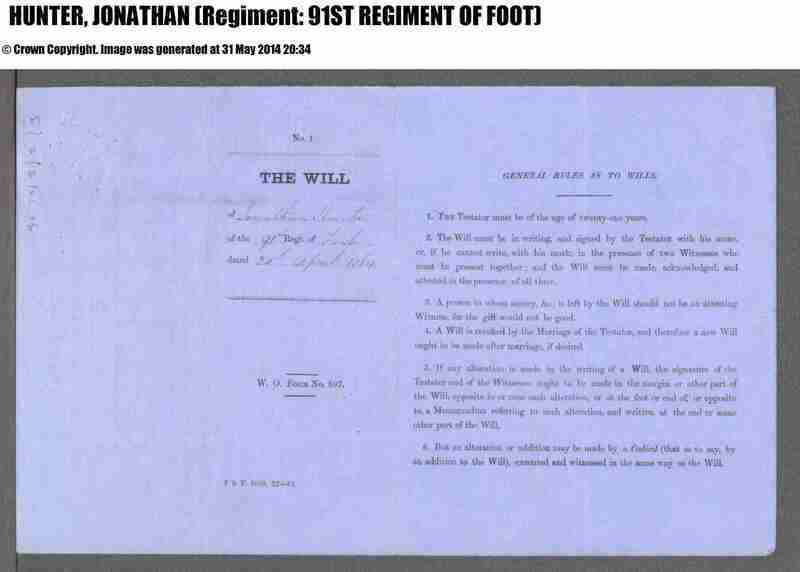 The full reference is shown SC70/8/2/3 with a title of “Will of 3938 unstated Jonathan Hunter, 91st Regiment of Foot, cause of death: died” all of which is given in the search on ScotlandsPeople. 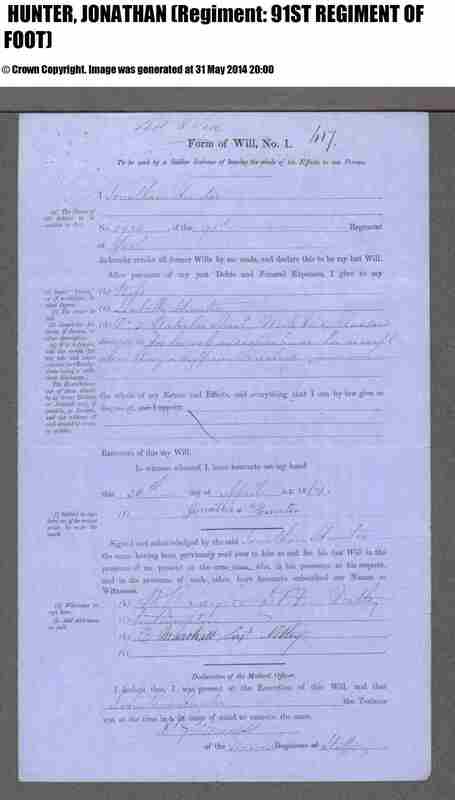 The one additional piece given is 20 Apr 1864, which is the date his will was signed. If this was your ancestor you could then return to ScotlandsPeople and download a copy of the will with more confidence that it matched the time frame for your ancestor. The will on Form of Will, No.1 states “to be used by a Soldier desirous of leaving the whole of his Effects to one person. Jonathan Hunter No. 3930, of the 91st Regiment of Foot, do hereby revoke all former Wills by me made, and declare this to be my last Will. After payment of my just Debts and Funeral expenses, I give to my wife, Isabella Hunter of No. 5 Waterton Street, Mile End, Glasgow, absolutely for her sole and separate use, her receipt being a sufficient discharge; the whole of my Estate and Effects, and everything that I can by law give or dispose of.” The will is then duly signed by three witnesses. At the bottom of the form there is a Declaration of the Medical Officer. “I declare that I was present at the Execution of this Will and that Jonathan Hunter, the Testator was at the time in a fit state of mind to execute the same.” Signed by a member of the Medical staff. Reverse of Will of Jonathan Hunter of the 91st Regiment of Foot, notice the rules for writing the will, and the faint reference SC70/8/2/3 in the upper left. On the reverse, which is actually the outside of the document when it is folded is a summary – The Will of Jonathan Hunter of the 91st Regt. Of Foot dated 20 April 1864. W.O. Form No. 897. Written faintly in ink on the side of the form, upper left, is the NAS reference number SC70/8/2/3. Interestingly this is the only place to find it. The reference number is not printed out on the image header. You can however figure it out from the full reference if you save it with full ScotlandPeople reference.